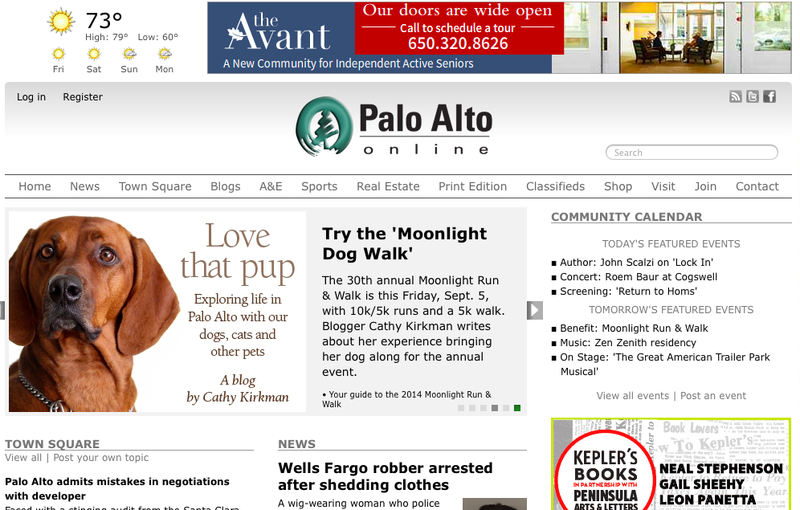 I have another blog called Love That Pup about dogs and animals over at Palo Alto Online, where I recently posted “Try the Moonlight Dog Walk,” about walking your dog at the annual Moonlight Run for charity. Since the event is sponsored by the Palo Alto Weekly and the City of Palo Alto, the Weekly thought fit to feature the post on the news slider of their home page. So here’s the screen grab from my dog Lady’s five minutes of fame. She is a Redbone Coonhound, although I am well-versed in explaining how she is not a Vizsla (they have light nose, light eyes, sporting group) or Rhodesian Ridgeback (lighter coat, ridge on back, more powerful build, although technically the better guess because they are also in the hound group). The Moonlight Run event is over for this year, but do think about going out and supporting it next year, whether as a runner, walker or dog walker!